…we asked the barista at one of our London cafés one chilly winter afternoon at the end of last year. While we stamped the warmth back into our feet and blew on our hands, barista Adam whipped up something short and frothy and unfamiliar: our first Salted Caramel Flat White. As soon as we tasted it, we knew we were in trouble. We were going to have to get something like this on the menu. And fast. We didn’t know it at the time, but it was our first Coffee Chocolat Latte: the White Chocolate option, with real grated flakes of our chocolate, a double shot of espresso and a comforting foamed feel. Now we had the basic idea, it was time to perfect it. Coffee and chocolate made sense together: cocoa and coffee trees grow together on our estate and in similar regions around the world, they’re fermented and dried similarly and, when it comes to enjoyment, we knew both were something people would stop and take their time over. Besides, chocolate and coffee had been paired before: the caffé mocha had been around for years. 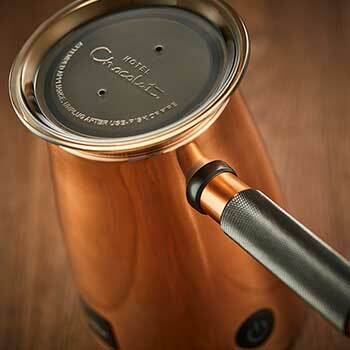 Our co-founder Angus told us, and he was right: to us, ‘mocha’ said cheap chocolate and over-roasted coffee. Premium cacao wasn’t a problem: it’s what we do. The coffee to complement it? Arabica, because it’s neither too sweet nor too acidic. But not burnt, as it so often is in an effort to keep the flavours consistent: instead, carefully roasted to bring out those richly nutty, chocolatey notes. David explained as he prepared our first taste. – and there they were, finally: our fully-fledged Coffee Chocolat Lattes. It’s been less than six months since that first Salted Caramel Flat White, and even that’s too long for us – which is why we’re bringing our Coffee Chocolat Lattes to your nearest café straight away. So whether you’re in need of something to wake you up on the way to work or a mid-afternoon pick-me-up, come in out of the cold and choose from Classic Chocolate (70%), 100% Chocolate, Salted Caramel, Hazelnut, Spiced or – where it all began – the White Chocolate Coffee Latte – and taste the difference that the best, natural ingredients make.